There's no doubt that the 2019 Jayco Eagle HT 29.5BHOK is one fantastic 5th Wheel! If you want to own it at a price that will astonish you, then come into TerryTown RV today! We're located in beautiful Grand Rapids, Michigan and we've been selling RVs for over four decades - all at huge discounts! We have acres of new travel trailers, 5th wheels, toy haulers, and more! You'll save thousands on your dream RV and get great financing too! We're conveniently located at 7145 Division Ave S Grand Rapids Michigan 49548! Or give us a call at 616-455-5590. With our worldwide fast, reliable delivery, you'll be in your perfect rig before you know it! Whenever your family is ready to hit the road for camping fun, this RV is ready to go, thanks to its hitch weight of 1708 lbs. and GVWR of 11000 lbs. When you reach your destination, you'll set up easily and quickly, and you can enjoy the outdoors and fresh air under the 19' 0" patio awning in shade and comfort. 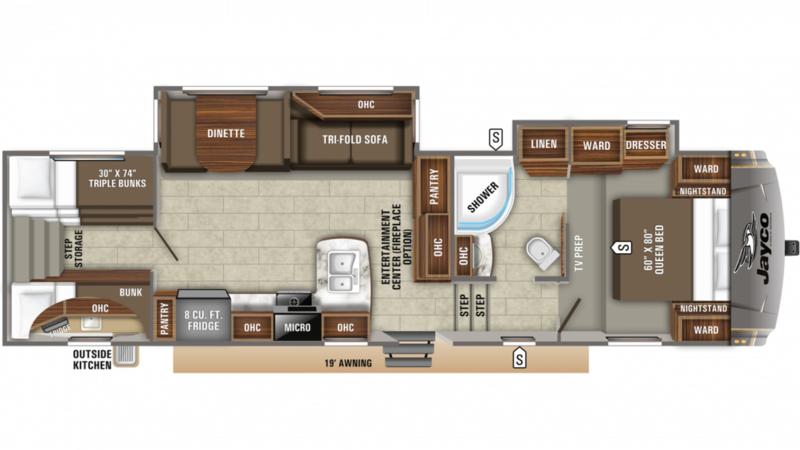 By expanding out the 2 slides, you'll enjoy increased spaciousness inside this 8' 0" wide, 34' 9" long RV! With a height of 12' 0", you won't have to worry about constantly hitting your head! The interior stays nice and temperature controlled with the 30000 BTU furnace and the 15000 BTU a/c! You don't need to worry about losing sleep on vacation, thanks to the snug Queen bed inside the master bedroom! A family of 10 can sleep comfortably inside! Among the many modern appliances in the awesome kitchen of this 5th Wheel are the handy 3 burner range cooktop and the roomy 8.00 cu. ft. refrigerator where you can store all your fresh meats, veggies, cheeses, and cold beverages! Your family will enjoy great meals every day! Fill up the 43 gallon freshwater tank for loads of clean, refreshing water on your trip! Take long, hot showers thanks to this model's 60 lbs. of LP tank capacity! The bathroom has a Porcelain Foot Flush toilet. The 33 gallon gray water tank and 33 gallon black water tank provide somewhere for the used water and waste to go without you having to see it! You'll love the roomy bunkhouse with its comfy Quad Bunkbeds. Kids and guests will love the convenience of having their own private space when they turn in at night after a full day of RV fun! Family picnics come easy with the help of the outside kitchen!